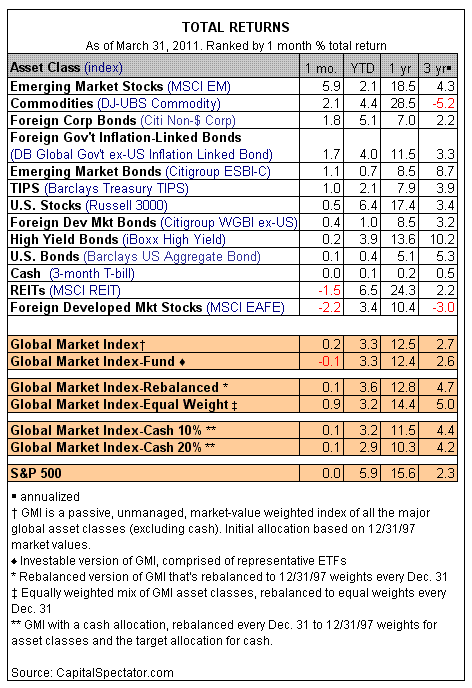 The major asset classes generally posted respectable gains in March, although red ink spoiled the party for foreign developed-market stocks and REITs. U.S. bonds overall managed to rise, but just barely, based on the Barclays U.S. Aggregate Bond Index, which inched higher by less than 0.1% last month. Inflation-linked Treasuries, however, jumped 1%–the third consecutive monthly gain for TIPS and the highest return since last October, as per the Barclays U.S. Treasury TIPS Index. The Global Market Index (our proprietary benchmark that passively weights all the major classes) more or less moved sideways in March, advancing just 0.2%. For the year so far, GMI is ahead by 3.3%. 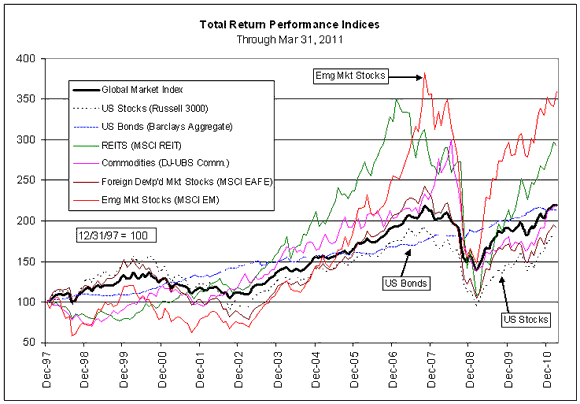 The big winner last month: emerging market equities. The MSCI Emerging Market Index soared nearly 6% in March, posting its first monthly gain since December. REITs also reversed the trend of late, albeit by suffering a 1.5% loss–the first round of monthly red ink for real estate securities since November as tracked by the MSCI REIT Index. U.S. stocks generally edged higher in March for the seventh straight month, based on the Russell 3000, albeit by the smallest gain for domestic equities on a calendar-month basis since the rally began last September.